An atmosphere of respect is of vital importance to the practice of Aikido, and etiquette is a group of actions affirming that respect. "To respect" is to extend consideration, courtesy and gratitude toward one's teacher, one's fellow students and oneself. Etiquette is also a means of providing a safe and harmonious environment for training. 1. Bowing can convey humility, respect, gratitude and apology. Let your ego become more flexible through sincere bowing. 3. Arrive on time for class, line up in seiza before the scheduled start of class. 4. Leave your shoes neatly on the shoe rack or at the edge of the mat. 5. If class has begun and you are late, wait at the edge of the mat until the instructor indicates that you may join the class. Step onto the mat and bow from seiza. 6. 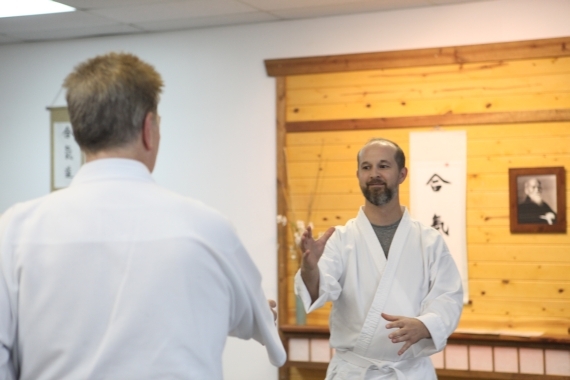 After the instructor has demonstrated a technique, quickly find a practice partner. 7. Students of any rank may practice together. Junior students are encouraged to seek out advanced students and ask them to practice. 8. The junior student is uke (the attacker) first and the senior student is nage (the defender). Usually, the technique is practiced four times (alternating left and tight) and then the roles of uke and nage are reversed. 9. Keep conversation to a minimum during practice. If you are seriously confused, ask for help. 10. When you or your partner accidentally bump into another practicing couple, extend an apology and bow. 11. Ask permission if you need to leave the mat during class. Obtain the instructor's permission before the beginning of class if you must leave practice early. 12. Create a respectful and attentive atmosphere during class: do not lean on walls, do not sit or stand with your back to the picture of O'Sensei. Be mindful of your personal hygiene. Do not wear jewelry or anything else that may result in injury to yourself of your partner. The above are guidelines that we follow at Aikido Orlando Dojo. When visiting other dojos, be attentive to their practices.